On July 25, 2017, I received a message from Dr. Nick Ross at Thomas Jefferson University. 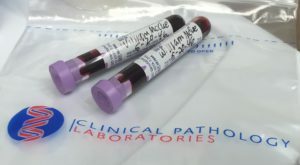 He reminded me that I had not sent in my blood samples for the ongoing PRP Research Study. I was mortified. Nah. Actually, at 71, very little mortifies me. At best I was embarrassed that yet another senior moment had become public. I told Nick I would submit the blood samples tomorrow. Sometimes “tomorrow” means nine days later. Oops. On Thursday, August 3rd, I did a little “recon” in the area near my home to evaluate the available shipping options. I started with FedEx (Preston and Highland). They wanted to charge me $30 and offered no help or insights. In fact, the sales person seemed concerned that I might be dealing with bio-hazard materials. Imagine her reaction if I had been standing there four years ago in my radiant glory — a six-foot, three-inch, 250-pound shedding strawberry. Forget FedEx. That left the U.S. Postal Service. 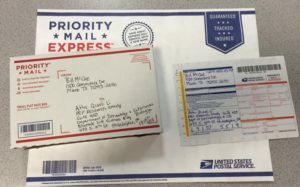 I told Mike, the postal clerk, what I needed and he handed me the Express Mail box, and Express Mail envelope, the Express Mail form and said “$28.50 and it will be there by noon if you bring it back here by 3:00 PM. No problem. I walked out of the post office knowing that my blood samples would be in Philadelphia by noon, the next day. I didn’t make an appointment with my family doctor. In sales it is called a “Cold Call.” I asked for Charlene, the Office Manager and explained my need for blood samples to her. She went “backstage” to check with Dr. Kaplan while I sat in the waiting room. In less than five minutes I was sitting in a different chair and having two “lavender” tubes filled with my blood. I was given the two vials and a biomedical bag. On the way out I paid $5 for the “procedure” and took two lollipops for being a good boy. It should be noted that Dr. Adam Kaplan, a General Practitioner, is well versed on the subject of PRP and quite familiar with the ongoing research at Thomas Jefferson University. I filled out the Express Mail form and returned to the Post Office. The postal clerk put the Express Mail box into the Express Mail envelope and affixed the form. I received the receipt and tracking number and paid $28.50. 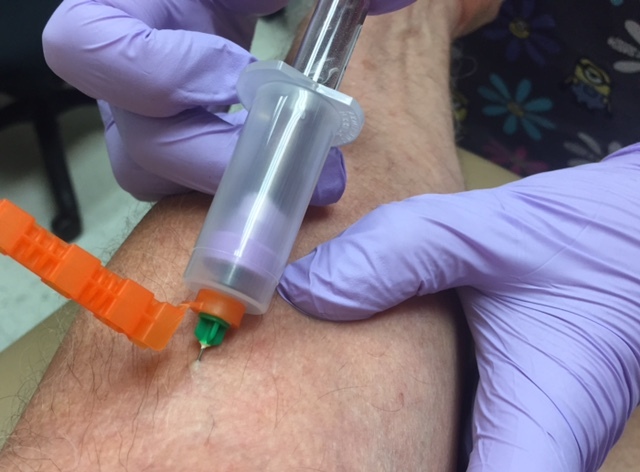 I hope EVERY PRP patient in the US will consider or reconsider participating in the ongoing PRP research underway at Thomas Jefferson University. I urge ALL those who have submitted their blood samples in support of the PRP Research Study to share your reasons.